I just received an invitation from Channel NewsAsia to appear on a TV talk show with Foreign Affairs Minister BG George Yeo. Blogger Gayle Goh has also been invited. The topic is "Big Boys Blogging” – the focus is on politicians and their blogs. The TV hosts would be the Flying Dutchman and Xue Ling. The programme is called BlogTV.sg. I was somewhat tempted. For a short while. Anyway, I've made up my mind. I'm not going. One year ago, an opportunity like this would have been really exciting to me. To appear on TV! And talk about blogs! With a PAP minister! Well, that was one year ago. And one year in Internet time feels like 10 years in the offline world. Since then the Singapore blogosphere has come a long way. Bloggers are no longer going to burst with surprise, delight or alarm just because the mainstream media or the government wants to talk to them. (Okay, maybe "alarm" is still applicable). The TV show will probably be a good chance for George Yeo to publicise his own blogging attempts (on Beyond SG and Ephraim Loy's blog). 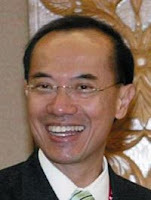 George Yeo has been blogging diligently for the past few months. But after the initial burst of public interest, hardly anyone bothers to read him anymore. But I bet George will keep on trying. So will the post-65 MPs. After all, remember what PM Lee Hsien Loong had prescribed? The PAP needs to be more hip and happening, and the government needs to use "new" media to reach out to the masses. The leader has spoken. And so the show must go on. "Mr Wang ... I also respect a lot" - Mr Brown. "Mr Wang is a particularly enjoyable read when exposing some of the nonsense that passes for news and analysis in the Singapore media." - Ringisei. "Eminently interesting." - Xeno Boy. "Many of Singapore's blogs are relatively innocuous diary-type spaces ... But others, such as Mr Wang ... take on hard social and political issues. "- Alex Au (aka Yawning Bread), Asia Times. "I am very impressed with the way he analyses things, to the point where I would feel much more confident about the Government if he were in the Government .... I do hope that the people in the Government at least pay attention to and reflect on what he says, because sometimes people need intelligent minds like Mr Wang to knock some sense into them. "- Jemauvais. "What I admire most about him is he doesn’t just talk a very good talk, he walks (sometimes runs!) his talk. He’s practiced what he’s preached to get some mind-bogglingly results in his life and I’m always looking forward to learning from this wise man...." - Alvin Soon. "Sharp and witty commentaries on social issues dear to my heart." - Dsnake1, Urban Poems. "For some good 'ironic' discussion of life in modern Singapore, go [to Mr Wang's blog]." - Malcolm Cook, Lowy Institute for International Policy. "Online he is a powerful, towering and booming presence." - Kuku Popz. "One of my favourite Singapore bloggers is Mr Wang ... I like his fine ironic and well pointed style." Stephan Wissel. "Apart from the fact that he writes insightful political pieces, he's also a terrific writer. "Monica Lim. "More interesting than Tomorrow.sg, more insightful than most Today columnists, I present to you The Great Mr Wang." - Kevin Lim. "When Mr Wang Says So, you'd better listen." - The Big Winner. "This guy is a genius." - Mr Darren. "I love reading "Mr Wang Says So". He is a well regarded and highly intelligent blogger." Ajish. "I hope policy makers get to readf what's on Mr Wang's blog." - Dr Huang Shoou Chyuan. "Mr Wang is a very perspicacious and effective blogger who comments on the political and social situation in Singapore." - Chris Hansen. "One of Singapore's most seditious bloggers." - Molly Meek. "I enjoy reading his entries, which touch on Singaporean issues in a style of his own ... check him out if you like thinking about current affairs." - Drunken Panda. "Mr Wang does his homework so that we can benefit from his incisive commentary." - Biased Observer. "... one of my favourite blogs." - Takchek. ""If the world at large took Mr. Wang's writing as a measure of the level of writing ability in Singapore, it would have appeared as if Mr. Wang had been hogging all the brain juice when it was being handed out." - Kaiserkai. [On Mr Wang's blog] "Oooh ... This is good." - Lilian. "Check out this man's blog. I'm officially a fan of Mr Wang." - Dawn L.
"A radical and revolutionary in the land of the happy and the clean (and the free-of-thought)." - Friskodude. "Mr Wang, you are certainly the best!" - Straydog. "Mr Wang - still the one and only." - Huge Whaleshark. "Mr Wang is undoubtedly one of the most popular political bloggers in Singapore .... his writing is fluent and thoughtful." - Kenny Yeo. "An authority that i refer to when i do [school] project. Serious ... Got ingredient(Liao) one ok!!" -Cuckoo Cake. "It is quite an enjoyment to read his blog, especially if you have similar views on the PAP like his." - Kurosaki Ichigo. "... the extremely astute and articulate Mr Wang. "- Benjamin Ho. [On Mr Wang's writing ability] "... another wonder that I'll never be able to accomplish." - Soulburnz. Mr Wang is a very, very clever man." - Porcorosso. "Mr Wang... very intellectual and influential man... also very caring" - Farmer. "I highly recommend articles by Mr Wang ..." - Dr Bernard Leong, Singapore Angle. "He's one of those few prominent bloggers in Singapore other than Mr Brown, Mr miyagi and xiaxue. I highly recommend his blog to you ... if you're interested in politics, and in Singapore affairs." - Azzuri. "Every once in a while I drop by his site for a good read and I'm always amazed at the rich content there." - Juz A Gal. "Witty regularly updated blog that hoot anybody but with gd reasons always carefully and funnily stated." - The Void Deck. "If you want witty discussions about politics and the government, please go to this excellent, often-mentioned-in-the-newspapers blog titled "Mr Wang Bakes Good Karma"." - Dr Oz Bloke. "[one of the] ... major political blogs/journals." - Abao. "A famous local philosopher ...." - Etched with Acid. "[Mr Wang is] a questioning Singaporean, one who does not take things at face value." - Ball of Yarn. "In Singapore, blogs like Mr Wang Says So .... are what a lot of Singaporeans read on a daily6 basis for a different perspective from the mainstream media. "- Nashrin. "It's all good. Hop over, bookmark the site, grab the feed. It's compulsory reading, class." - N Sivasothi. "The online environment is really a credibility game, just like the real physical world we live in. Folks need to establish their “cred” in order for their comments to be recognised. That’s why many people continually return to read ... Mr Wang ..." Endorphin Junkie. [During the 2006 General Elections] "The entire Channel NewsAsia election converage team is not even comparable to individuals such as Mr Wang Says So ...." - Feynman Boson. "...[my] favourite social commentator, Mr Wang ..." - Numnut. "Fantastically well-done articles." - Edward Lim. "A very informative and thought-provoking blog in general." - weekeegeepee. "One of my favourite blog reads ..." - Caffetteria. "... really good writing on many social, political and other issues. Great read." Arzhou. "Political blogs like Mr Wang's give Singaporeans a chance to express what they feel about different issues." - Jiayi. "... one of the most respected bloggers in Singapore ..." - Vince Liu.